Submitted by Dan Dooré on Wednesday, May 16, 2018 - 14:49. A UNIQUE MINDBOGGLING GAME OF MULTIPLE SKILL LEVELS. Take command of the wackiest collection of misdirected rodents ever seen on your screen. I really don’t see why I should bother to explain about Lemmings, since it is available on most popular systems. Oh well here goes! The object of Lemmings is to help guide a pack of cute but dumb lemmings across a series of different landscapes. Your basic lemming is rather dumb. It just keeps walking forwards until it either can’t go any furthur and it turns around, or it dies by ie falling into some water. However, you are allowed to give some of these Lemmings, carefully selected skills, ie to dig through scenery, or fall great heights. Though the number of skills you may give out are strictly limited. The aim is simply to use these skills to get a percentage of lemmings across each level to thier ‘home’. You have loads of levels, of varying difficulties, and occasionally get unusual traps and things to get past. Lemmings is a great game, the animation is wonderfully smooth and cute, and the tunes are perfect lift muzak. So how does it compare to other versions? Well, naturally it is slightly slower than some versions. But then the Sam is slightly less powerful than an ARM 3! It is however still perfectly playable. There is quite a bit of disk access, which can get slightly tedious between levels, but it’s not that bad, and is all on one disk, so at least there is no disk swapping. Wow! I’ve done it again - remembering the Fred address from memory, this time! 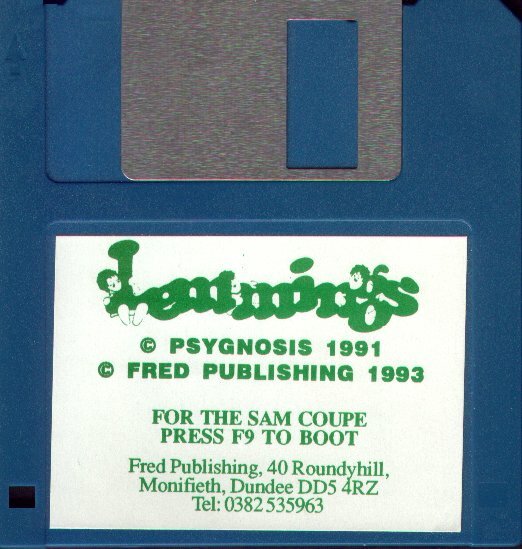 This shouldn’t over shadow the fact that at last Psygnosis, one of the big software giants, has seen sense and decided to put Lemmings on the Coupe! This incredibly much loved (and much converted to other formats) title is now available for the SAM. As usual, there was the usual faffing around before it’s release (including a second improved version, seeming that the first was a little defective) and the fact that Chris White, the programmer, delayed the release by formatting the master disk. But at last! It is here! On each incredibly nice looking level, you must save most, if not all the Lemmings from impending doom. You can move your cursor left and right to select Lemmings and fire to change them into a more useful Lemming. Lemmings can be trained to smash through walls, lay flights of stairs to cross gaps, stop Lemmings from going any further, parachute down safely from a high point, and the most vindictive bit of all - nuking them! 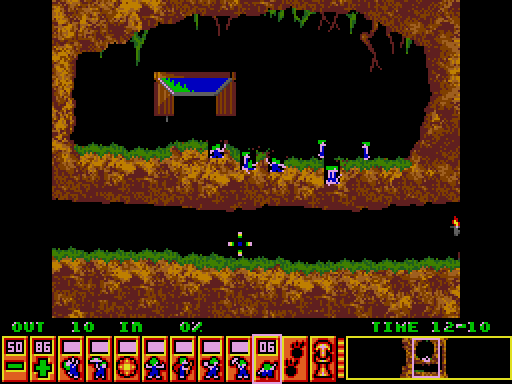 At the start of every level, a trap door opens and allows the Lemmings to start falling from the sky. 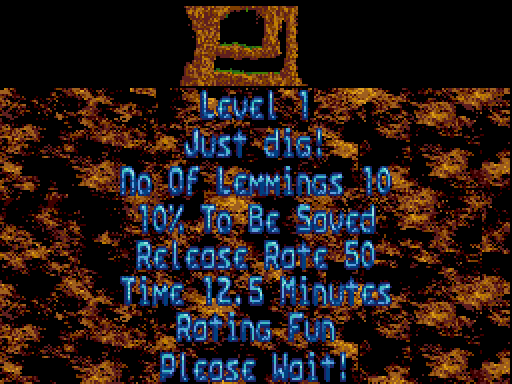 You can control the rate at which Lemmings fall using the cursor, and you can also use this cursor to scroll left and right across each level and see just what lies in store. That’s all I can remember from my School PC playing days, so let’s link up “live” with Lee Bubel Willis, and see what the tike is up to with his (grrrr) review copy of Lemmings which he has at home! 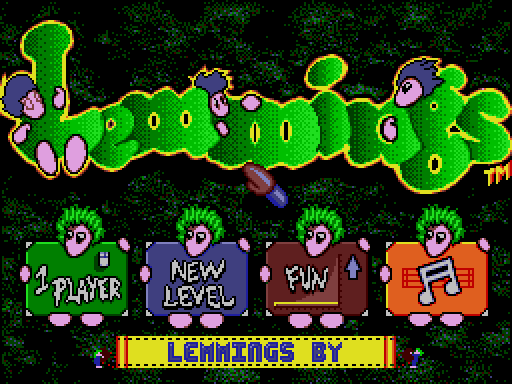 Lemmings appeared on PC, ST etc. a few (2 or 3) years ago, and made a BIG impact!. Imagine the impact that dropping a large cow from the top of the empire state building on top of someone would make. Well Lemmings made an even bigger impact than that. At long last Lemmings has appeared on our beloved SAM. Programmed by Chris White (Who also coded the excellent Prince of Persia ) and licensed from PSYGNOSIS by Fred Publishing this promised to be possibly the best game so far on SAM. There was a great deal of expectation when rumour got round that Chris was working on Lemmings. Would it be any good? 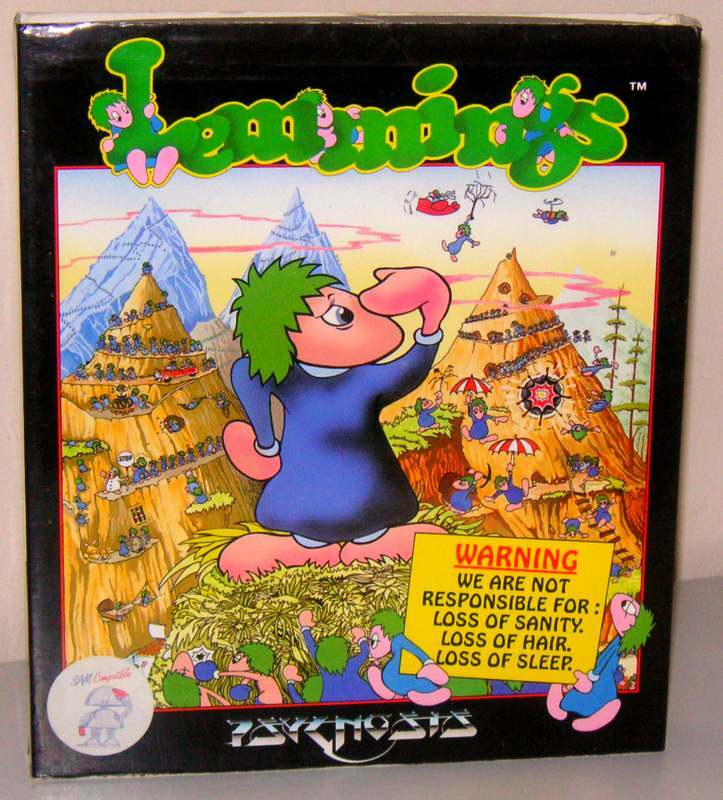 On receiving my copy of Lemmings I was hesitant as to whether or not it would actually be any good. After all the machines it was originally designed to run were (in most cases) at least twice as powerful. Is Lemmings as good as I thought it was going to be? Frankly the answer has to be NO. IT WAS BETTER! 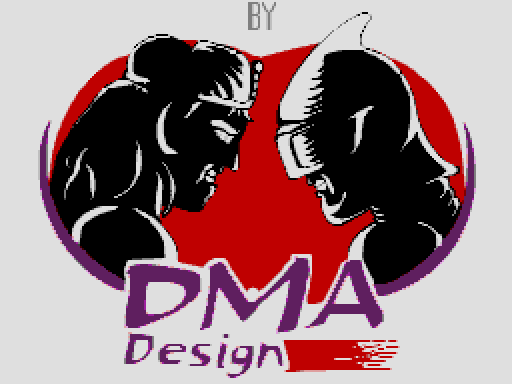 The graphics are taken from the Amiga version (Or the ST, I’m not too sure) and then been improved, I was stunned by the visual quality of the game. Congratulations to Neil Holmes and Doug Holmes . The music too is superb, and written with great feeling for the game, not too heavy, not too light, just perfect. Credits for musical talent to Craig Turberfield . The animation, and gameplay however is what makes any game good, and that it has to be said, is very amazing! I was shocked at how fast the game ran, not that it’s lighteningly fast, but it’s only very slightly slower than the other versions, and with the nature of the game, it’s still damn hard to play. I confess that I am a bit of a fan of puzzle games, and there may be people out there who are thinking … Oh, no! Another puzzle game, and admittedly there are a lot of them around (Come on, programmers! ), but Lemmings is definitely worth buying. Overall I was impressed with the game, and I’ve been playing it since I got it. In fact I had trouble trying to stop playing it long enough to write this review, but I did, and I think my family have probably forgotten what I look like by now! Buy this game now!